What happens if you ask people to pick a number `at random’ between 1 and 100? I saw this circulating on Twitter and thought I would share it here; it was originally posted on reddit. The graph shows the results obtained when 6750 people were asked to pick an integer `at random’ between 1 and 100. 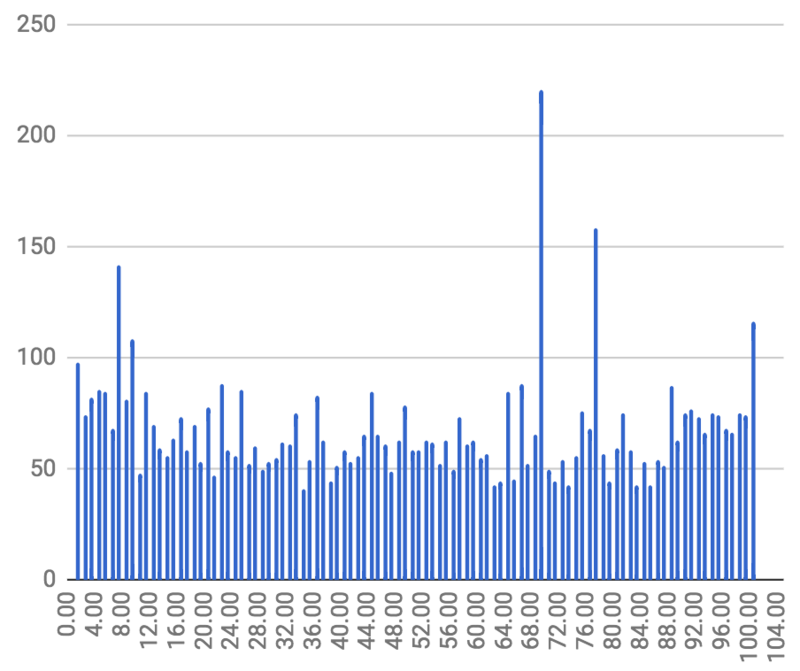 You might naively expect the histogram to be flat (give or take some Poisson errors), consistent with each number having the same probability of being picked, but there are clearly some numbers that are more likely to be chosen than a constant probability would imply. The most popular picks are in fact 69, 77 and 7 (in descending order). Anyway, it proves a point that I’ve made more than a few times on this blog, namely that people generally have a very poor idea of what randomness is and are particularly bad at making random choices or generating random sequences. This entry was posted on April 11, 2018 at 3:09 pm and is filed under Bad Statistics with tags randomness. You can follow any responses to this entry through the RSS 2.0 feed. You can leave a response, or trackback from your own site. And why is 42 not above average? What kind of strange sample was this? 42 is not random, it is the answer. Some very unpopular choices in there, too. But odd the effect seems much less pronounced in that direction! We’ll get to the bottom of it eventually. When I was in my late teens I asked myself exactly this question. Wthout actually doing a sample, I decided that the *least* likely number would be 83. So I selected that as the number for my football uniform shirt, which I still have! Looks like I was pretty much on the money! On what basis did you make this decision? Large prime, not associated with any popular concept or common idea. No special relationship between digits (not sequential, not factors, …). Seemed like the most boring number I could think of. When Hardy visited Ramanujan in hospital, the former remarked that the registration number of the taxi was an unremarkable number: 1729. Ramanujan immediately said that it is the smallest number which can be written as the sum of two cubes in two different ways. the sum of three consecutive primes (23 + 29 + 31). the sum of five consecutive primes (11 + 13 + 17 + 19 + 23). the 23rd prime number, following 79 (of which it is also a cousin prime) and preceding 89.
an Eisenstein prime with no imaginary part and real part of the form 3n − 1. Note that all numbers are interesting. Assume that this is not the case. Then there must be a first non-interesting number. But that fact makes it interesting, so it is not a non-interesting number. Lather, rinse, repeat. Q.E.D. Poor old 34. I feel sorry for it. It would be interesting to see this graph broken down by gender. It would be particularly interesting to see the gender breakout for those who selected 69…..
Shouldn’t the distribution be symmetric with respect to a (perhaps the) point? You probably meant “breakdown”, but “breakout” might work here as well.